When using primary antibodies derived from the same species as the sample material (species on species) non-specific background staining can occur. Mouse on mouse staining (M.O.M. staining) is a common example of the problem. This article explains how you can prevent background signal in Species on Species experiments. The species on species problem occurs when using a secondary antibody to visualize a primary antibody on a sample derived from the same species as the primary antibody. 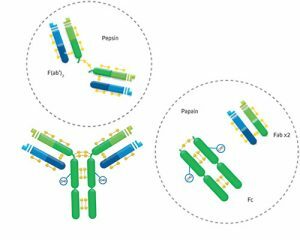 Endogenous immunoglobulins presented by the tissue are recognized by the secondary antibody, which is unable to distinguish between primary antibodies and endogenous immunoglobulins of the same species. The resulting non-specific staining can obscure signal from the primary antibody or reveal a misleading staining pattern. JIR offers tools to help you avoid background when conducting species on species experiments. 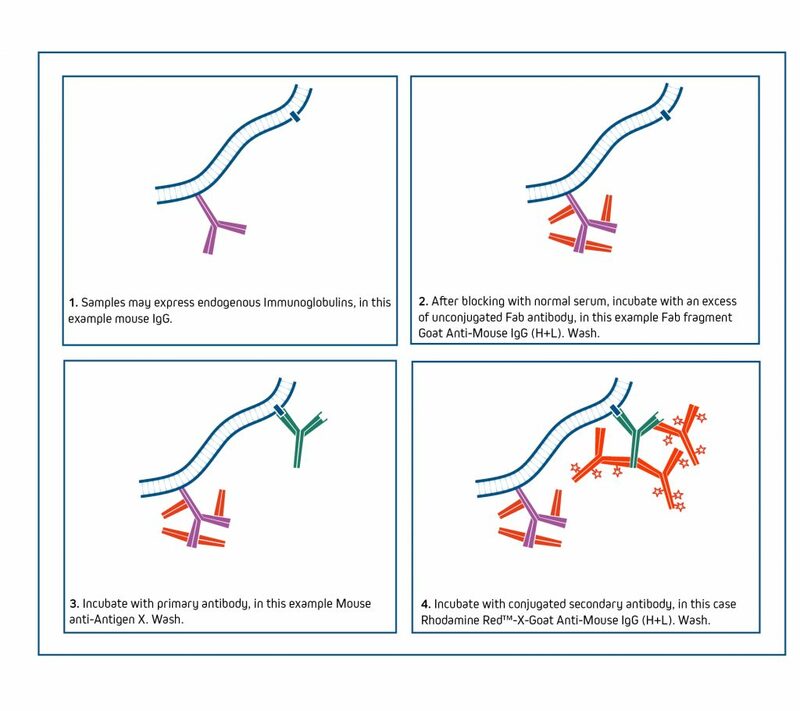 Monovalent Fab fragments can be used to “mask” or block the endogenous Ig epitopes, making them unavailable for detection by the labeled secondary antibody. Fab fragments have a single antigen binding site, so they will not capture the primary antibody used in a subsequent step. In contrast, whole molecule IgG and F(ab’)2 fragments are divalent (they have two binding sites) and are ineffective for blocking endogenous Ig. After binding the endogenous Ig with one arm, a divalent antibody may have an open binding site which could capture the primary antibody introduced in a later step. Figure 1: The digestion of IgG (approximate MW = 160 kDa) yields a number of different fragments. Papain digestion generates two monovalent Fab fragments and an Fc fragment, each about 50 kDa. Pepsin digestion degrades the Fc domain, leaving a divalent F(ab′)2 fragment with approximate MW of 110 kDa. 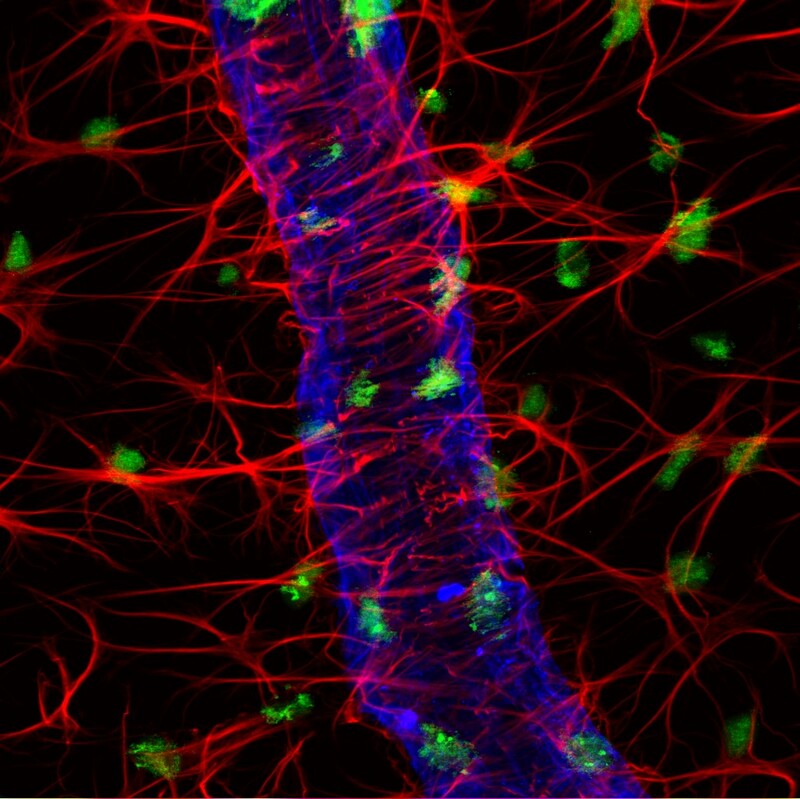 Choose a Fab fragment raised in the same host as the labeled secondary antibody, e.g. 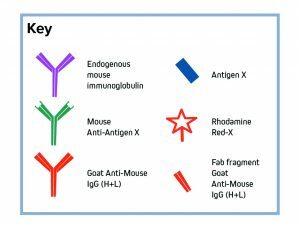 Fab fragment Goat Anti-Mouse IgG (H+L) to block binding of labeled Goat Anti-Mouse IgG. Maintaining the same host species ensures non-reactivity between the Fab fragment and labeled secondary antibody. In addition, a Fab fragment raised in the same species will recognize, and therefore block, the same epitopes that the labeled secondary would recognize. A different host animal may recognize different epitopes on the endogenous Ig, and blocking could be incomplete. Block with 5% normal serum of the same species as your labeled antibody. Incubate with an excess (20-40 μg/ml) of unconjugated Fab antibody of the same species as the tissue used. Proceed with your usual protocol. Negative control: Blocking efficiency can be confirmed by eliminating the primary antibody from the protocol and incubating with the labeled secondary antibody. Proceed with full labeling protocol after confirming that endogenous signal has been suppressed. It may be necessary to increase the concentration of Fab antibody up to 100 µg/ml to suppress signal from high levels of endogenous IgG. To avoid displacement of the Fab antibody by the labeled secondary antibody, a light post-fixation with glutaraldehyde may be necessary, provided that it does not affect antigenicity of the target proteins. Fab antibodies are not as effective for blocking immunoglobulins in Western blotting or ELISA applications. Working with closely related species? Secondary antibodies against one species are likely to cross-react with other species unless they have been specifically adsorbed against the other species. Antibodies with “(min X… Sr Prot)” in the description have been tested and/or adsorbed against IgG and/or serum proteins of those species indicated in the parentheses. They are recommended when the presence of immunoglobulins from other species may lead to interfering cross-reactivities. *Caution: Anti-Armenian Hamster IgG (H+L) (min X Bov, Hu, Ms, Rb, Rat Sr Prot) may not recognize all Armenian hamster monoclonal antibodies since it has been adsorbed against closely related species (in bold). Therefore, it is better to use an antibody adsorbed against fewer species, such as Anti-Armenian Hamster IgG (H+L) (min X Bov Sr Prot), except in those cases where Armenian hamster monoclonals need to be detected in the presence of mouse and/or rat immunoglobulins.